I have had many requests for tabletop mannequins, both vintage and new, over the past year. So given that vintage tabletop mannequins come along so rarely, I have created a range of new mannequins which are designed exactly in the style of the originals. They are ideal for displaying jewellery or favourite scarves and their size means that they can be displayed anywhere, without the need to find precious floor space. As with my floor standing mannequins, my main aim was to reproduce these new mannequins to as closely resemble the original vintage mannequins as possibe, both in design and tailoring. To this end, the stand, neck cap and finial have been individually hand made to mirror exactly the vintage models. These mannequins are 94cm from the top of the finial to the floor, but are height adjustable and so can be made taller than this. They can be tailored in any of my current fabrics and are a size 10/12. I can also tailor them in any fabrics you would like to provide. This gorgeous vintage Stockman French mannequin dates from around the 1920s/30s. I just love it when I find antique mannequins in this wonderful condition - gently aged, with all the signs which make her a genuinely vintage piece, but with no serious damage to the fabric covering. The fabric covering has that lovely age darkened look, with some rubbing and fraying at the shoulders and neck. The Stockman markings can be seen at the bottom of the torso and also embossed into the original turnkey on the stand. I love her finial - more ornate than usual - and the warm colours of her stand. I was very lucky to find two superb c1890 vintage wasp waist French mannequins lately and have just added them to my site. One is a classic antique Stockman mannequin and all the superb workmanship of this premier make of mannequins is evident in the exacting seamwork. The other is a name I have not come across before - she is made by E.A.Merle and the makers mark can be seen on the fabric at the base of the torso, along with the address of the street in Paris where she was made. It is always fascinating to find new makes of antique mannequins, especially the wasp waisted variety! I can only think that this was an independent shop which made bespoke dress forms for individual customers, unlike Stockman, who produced mannequins across France. Who knows? But I would love to think that this beautiful wasp waist form was made specifically for a partucular lady, who could have then had her seamstress tailor her wonderful dresses using it. I have also added a wonderful 1940s/50s antique Stockman mannequin. Just thought I would stop by to add some pictures of this wonderful vintage mannequin. 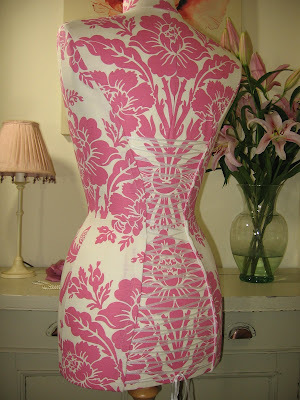 I just love the wasp waist mannequins of this era, they are so evocative of tiny waists and beautiful dresses. What a gorgeous silhouette, but imagine being the women who used to have to wear the dresses designed on these mannequins - it makes me breathless just thinking about it! This mannequin has just been sold, but if you are looking for a vintage mannequin then you could join my mailing list and I will notify you when new ones are added to the website. At Christmas my local Laura Ashley was covered in this wonderful fabric. It looked so striking that I knew that it would make a lovely mannequin, so I bought a few metres and got to work. She turned out exactly as I had imagined she would! The pink fabric in the picture is cotton, but it also comes in a beautiful woven jacquard available in cerise, duck egg and charcoal. I was lucky enough to be able to work with the charcoal woven jacquard for a lady who ordered a mannequin in this fabric, finished with a traditional tailored back. Well, the sun is shining, the sky is blue and the daffodils in the garden are out. It is still very cold! But it is days like today that thoughts my go to towards Spring. It seems to be Winter one moment, then suddenly the days become longer and I am no longer getting up in the pitch black! I have to say that lighter mornings make it so much easier to get up in the mornings. I think Cath Kidston fabrics are just perfect for this time of year. Her beautiful florals are so feminine and complement both modern and country styled interiors wonderfully. 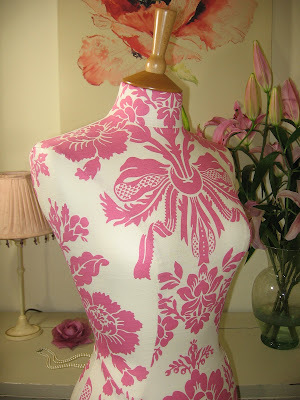 I will have a new range of Cath Kidston mannequins coming soon - I can never resist the introduction of a new fabric!